The picturesque surrounding of Markanday is something one should see during their trip to Bilaspur. The beautiful Markandeya Ji Temple, situated here holds much significance, especially amongst childless couples and is named after the famous sage Rishi Markanday, who lived and meditated here. The temple is located 20 km away from Bilaspur and is easily accessible by a private car or bus. 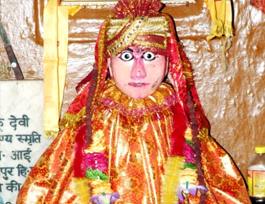 Markandeya Ji is worshipped here as the savior of children and couples pray to him for long life of their children. Highlights A big fair is organised here on the day of Baishakhi every year that attracts a huge number of tourists and pilgrims, who seek the blessings of Markandeya Ji for the welfare of their children. It is belived that there is a tunnel nearby this area, which connects Markandeya and Vyas Caves and the sages used to visit these caves through this tunnel. Also, some people believes that if a childless person applies kajal in one eye of the idol of Markandeya Ji, then he or she has to apply the same in the other eye when blessed with a child. The tourists can also take a dip in the holy spring situated here, which is said to cure infertility and infant diseases. History There is an interesting story, which people believed to be true and it revolves around one rishi Mrikandu. It is said that the rishi had no children and so he used to pray to Lord Shiva fervently for a child. Very soon, the Lord Shiva blessed him with a son, but also told him that his son will not live long and will die after reaching 12 years of age. Mrikandu named his son Markanday and started living in the constant fear of death of his only child. When Markandeya Ji came to know the reason of his father's fear, he started worshipping Lord Shiva at the same place where the idol stands today and was blessed by the lord, with a long life, on the day of Baishakhi. At the very moment, a spring of water started flowing there and since then, the spring is considered holy and it is said that the pilgrimage of Char Dham is complete only when one takes a dip in this spring.